This week we look at book covers, flying cars, how smart phones are making us stupid plus more. 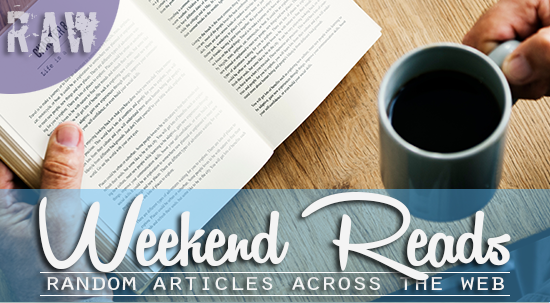 So when it's time to relax this weekend, grab your favourite beverage and have a read of the following articles. You’re sitting on the subway, or on a park bench. Nearby, a stranger reads a book — a printed, bound book. You can read its title. Maybe you recognize, with a jolt, the colors, imagery and typeface on its cover. For readers of a certain age, a particular book cover can spark memories and quicken the heart. And, if you’re bold enough, the sight of someone you don’t know reading a book you know intimately well — “Jesus’ Son,” or “Americanah,” or “Something Under the Bed Is Drooling” — might just open the door to a conversation, a friendship, or more. The cliche “don’t judge a book by its cover” never made sense to me. Ever since I was a kid, I would pick out the books I wanted to read by looking at their covers. Having your smartphone in close proximity not only distracts you from the task at hand, but reduces your ability to handle more complex cognitive actions such as remembering and processing data. A newfound ancient family of asteroids is nearly as old as the solar system, and it could shed light on how Earth and the other planets formed, a new study finds.